What is the Quick filter and how to use it? 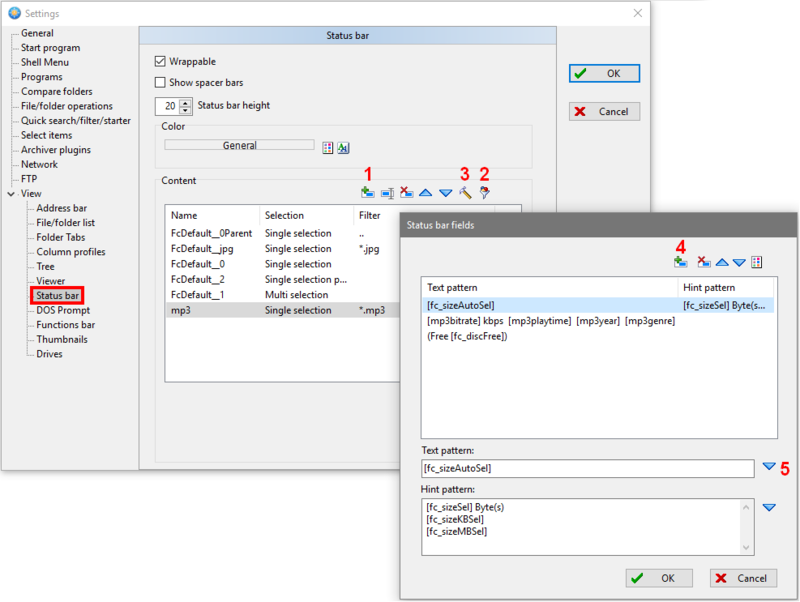 The quick filter provides the possibility to decrease the number of shown folders and files. It is sufficient to type a filter string in the “Quick filter input field” (at the right end of the status bar) to filter files and folders quickly. Only files and folders are shown then, whose names contain the quick filter string. 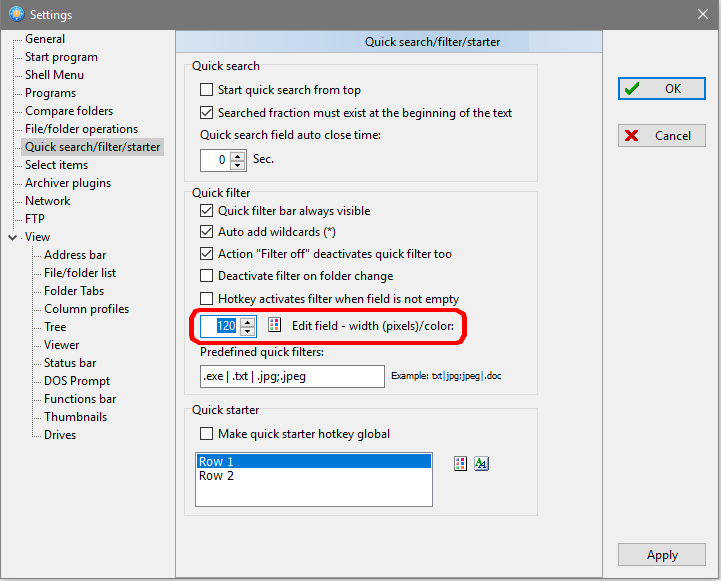 To activate the quick filter, start typing within the quick filter field. To deactivate, click the quick filter button. You can use the quick filter button to toggle quick filter. Quick filter field is too narrow. Is it possible to make it wider? Yes, it is, in the “Settings (F12) → Quick search/filter/starter → Quick filter” increase the number in the Edit field – width. I don’t use quick filter. Can I remove it from status bar? Yes, you can remove it in the “Settings (F12) → Quick search/filter/starter → Quick filter” by unselecting the option “Quick filter bar always visible”. I would like to see different information for some file types (e.g. mp3) in the status bar. Can I change the status bar content depending on the file type? Yes, you can customize the status bar information, open the Settings (F12) → View → Status bar → Content → then click the button “Add new item” → “For single selection” → enter the name (e.g. mp3), press Enter, then click the button “Filter”, enter the extension (e.g. *.mp3), press Enter. Finally click the button “Define Details” to customize the status bar information for selected file type. You can use the buttons “Add new field” and “Text pattern:” to add new items. 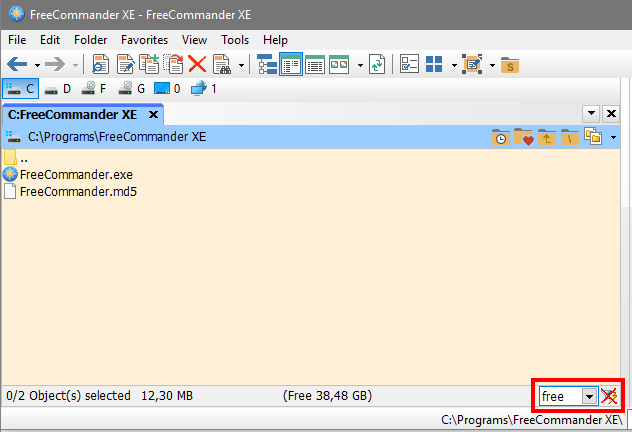 The file size in the status bar is displayed with one unit (e.g. MB). Can I see the size in other units too? Yes, you can move your mouse cursor over the file size to see the other units as tooltip. Can I change the font and the background color of the status bar? Yes, you can change it, open the Settings (F12) → View → Status bar → and use the color button within the “Color” area. Can I switch off the status bar? No, you can’t hide the status bar. My status bar has two rows. I would like to have just one row. Can I change it? Open the “Settings (F12) → View → Status bar” and unselect the option “Wrappable”. The information in the status bar does not fit in one line. What can I do? Open the “Settings (F12) → View → Status bar” and select the option “Wrappable”. Alternatively you can move your mouse cursor over the status bar to see more information as tooltips.